Recent stock market volatility, natural disasters, economic and political unrest have spurred a great deal of anxiety among Filipinos. Concerns about quality of life, uncertainty of events and financial well-being have continuously disturbed the Filipino psyche, further intensifying a feeling of insecurity when it comes to financial affairs. As these disruptive events continue, a change of perception is critical. It is not simply riding out the storm, but seizing the opportunity that comes with the crisis. After all, there is no better time than today. It could be wrong to assume that Filipinos are not involved with their finances. But misconceptions and passive responses hinder the effective means by which to react to these anxieties. It is on this premise that Sun Life Financial-Philippines conceptualized It’s Time!, a financial literacy campaign designed to further educate Filipinos on how to effectively prepare for the future. According to SOLAR (Sun Life’s Study of Lifestyle, Attitudes and Relationships), 86% are concerned and very concerned about inflation. However, 67% think savings and time deposits give the best returns in the long term. The same study stated that health ranks among the top concerns for Filipinos. Thus it is not surprising that 76% are concerned about paying for health treatment. Still, an overwhelming 85% will rely on savings as opposed to 35% who depend on health insurance. On retirement, studies have indicated that of 100 Filipinos who retire, 45 are dependent on their relatives, 30 are dependent on charity, 22 are still working and only 2 are financially independent. 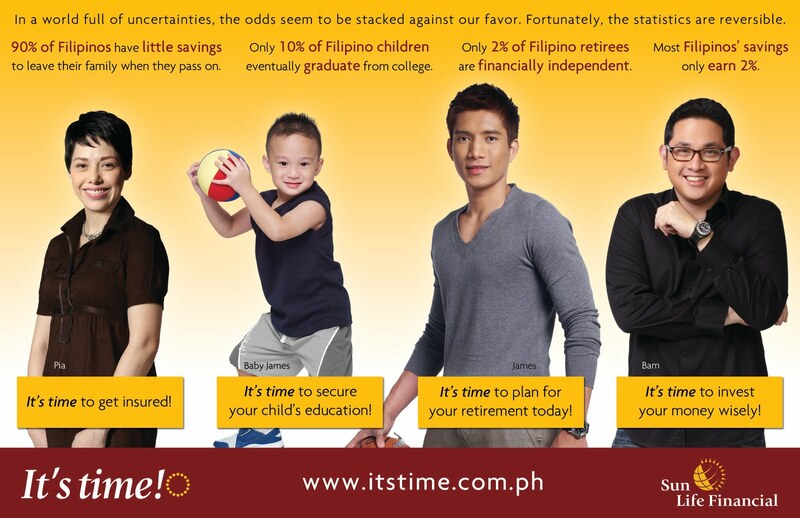 This just goes to show how lacking Filipinos are when it comes to retirement planning. It is also not surprising that insurance penetration remains low: 45% of AB market; 30% of C1 market; and 17% of C2 market. And though 50% say they are likely to buy either life or health insurance in the next 12 months, the historical growth rate of insurance sales per annum is a mere 3%. “There is this great disparity between the perception of Filipinos and what they actually want to happen. We want them to be pro-active, instead of passive! Fortunately, Sun Life has the answer for them,” declares Sun Life Financial Philippines (SLFP) chief strategic marketing officer Greg Martin. Pursuing its mission of providing a secure and stable future, SLFP latches on the urgency of current conditions to educate the market on how to manage and grow their hard-earned money. It’s Time! also counters the usual objection of “no money, no need, no hurry.” For Martin, these are mere excuses to delay the meticulous task of putting one’s finances in order. Images of endless receipts and slouched-on-the-chair-until-midnight often terrify even the most purposive clients. To bring all these insights and lessons to fore, the advocacy was launched last July 2009 with a tri-media campaign featuring Pia Magalona and Bam Aquino. 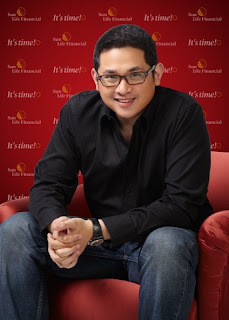 While Pia Magalona drove the point of the importance of insurance from her personal experience upon losing Francis, Bam spoke about the importance of starting the habit of investing early and regularly. Six months upon launch, the company is now introducing new endorsers, James and Baby James Yap. This time, the new endorsers highlight the lesson on planning for one’s retirement. The celebrity status of these advocates will certainly attract more attention to the advocacy message. And to ensure that the message gets across, Sun Life has produced TV commercials featuring these celebrities. 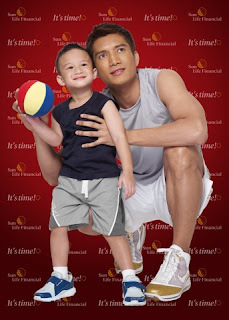 Currently running is the father-son TV ad featuring James Yap and Baby James as shown in primetime programs. The TV commercial is supplemented by print ads in major broadsheets as well as billboards. Blazing the trail of financial advocacy, Sun Life Financial held the first It’s Time blogger event last February 27, 2010 at Buenissimo by Cafe Ysabel at the Eastwood Mall. Advocates Bam Aquino and Pia Magalona joined netizens of different interests in a discussion about the importance of insurance and investment. It’s Time! aims to address the market’s growing need for information and guidance about financial planning. Through a multi-media approach, Sun Life wants the public to act with more urgency in fulfilling their financial goals. Aptly called Blog Time, the affair came at the heels of a nationwide mall campaign that aims to cultivate awareness and empower Filipinos to achieve financial freedom. 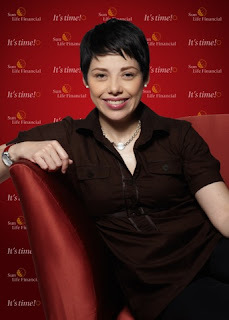 “We believe that bloggers are today’s thought leaders, and they can help spread the powerful message of financial planning through their digital medium,” said Sun Life marketing services head Mylene Lopa. As a social entrepreneur, Aquino imparted the lesson of saving and investment, a value nurtured by his own parents. On the other hand, Magalona espoused the benefits of life insurance, which helped her family recover from the early loss of her husband. Both shared personal stories and even tips on how to start one’s own journey to prosperity. To encourage active online participation in the advocacy, the Tell-a-Friend program allows an advocate to invite their friends to also sign up. Prizes at stake are Rudy Project watches, SunPIOLOgy calendars, and Kulay Pinoy diaries. Sun Life of Canada (Philippines), Inc. pioneered life insurance in the Philippines in 1895. Today, Sun Life of Canada (Philippines), Inc., is one of the largest and most trusted insurers in the country with almost a half a million policies in force and is boosted by the strength and stability of Sun Life Financial shares in the Philippine Stock Exchange. Sun Life Asset Management Company, Inc. (SLAMCI) is the fund manager and principal distributor of the biggest family of mutual funds in the Philippines, the Sun Life Prosperity Funds. Sun Life Financial Plans, Inc. (SLFPI) is the second wholly-owned subsidiary of SLOCPI and the sole distributor of its pension and education plans.